Rally is the new dog sport that is sweeping the nation. It was created to promote a positive relationship between the dog and his owner, animation and enthusiasm throughout the performance is encouraged. The emphasis is on fun and excitement for the dog, handler and the spectator by providing a more "natural" approach to the performance. Some have described Rally as a combination of agility and Obedience. Each team is judged on the execution of a single continuous performance of numbered exercises on a course uninterrupted by orders from the judge. There are no 1/2 point deductions in Rally. Only those errors that normally would be assessed as full point deductions in Obedience are scored. Perfect heel position is not required but you must maintain a loose leash at all times. Harsh verbal or leash corrections are not tolerated! Anybody! Rally was designed with the average pet dog owner in mind as a way to introduce them into the world of dog sports and to just to have fun with their dogs. Whether you've just completed your CGC (Canine Good Citizen) and are looking for something else to do, or you want to bone up on your obedience skills, Rally has something to offer you and your companion. Rally is a wonderful sport for dogs and handlers who experience "ring stress", or otherwise would not the successful in traditional obedience. The Novice level is all on leash. You are allowed to use multiple hand and verbal cues and you can talk to and encourage your dog throughout the performance. Rally also makes a great entry level class for obedience, agility and freestyle. But don't be fooled, Rally is not as easy as it looks! You must work closely as a team as you negotiate the course while heeling from sign to sign. Some of the exercises are quite complex and at the master level there are 50 to close from! While heeling, the team makes a 270� turn to the handler�s right (arrow indicates the path of the team). 270� turns are performed as a tight circle, but not around the exercise sign. Call Dog Front � Finish Right - HALT. While heeling, the handler stops forward motion and calls the dog to the front position (dog sits in front and faces the handler). The handler may take several steps backward as the dog turns and moves to sit in the front position. The second part is the finish to the right, where the dog must return to heel position by moving around the right side of the handler. 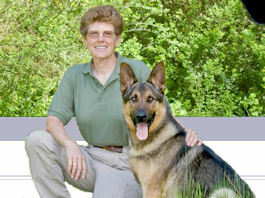 Dog must sit in heel position before moving forward with the handler. If you would like more information, please click here to send us an email or give us a call at (209) 223-3194.